Here's a very good starter eyepiece that won't break the bank! With a 1.25" barrel and 8 mm focal length, this compact and lightweight eyepiece gives bright, crisp, and wide-angle views of the Moon, planets, and deep-sky sights with any telescope. High-index glass with broadband multi-coatings enable a wide 60 degree apparent field of view with excellent color correction and minimal image distortion. Blackened lens edges and anti-reflection threads ensure maximum image contrast. Viewing position can be adjusted with fold-down rubber eyecups. Made from black anodized aluminum, and the base of the barrel is threaded for standard 1.25" filters. To minimize the need for refocusing, this eyepiece is parfocal with other eyepieces in the same series. 3.9 (Based on 13 Reviews) 92% of reviewers recommended this product. When I purchased this EP a few years ago it was more to cover a gap in my eyepiece collection than the 60 degree FOV. How things can change with time and a bit of experience. My first impression upon receiving the item was favorable. It was carefully packed, which indicates the importance the seller puts on the product. I took the EP out of the box and gave it a quick once over. I did not see any marks, scratches, or other damage. I gave it a good shake. I do this to see if the lens and all of the items inside the housing are tight. It all checked out fine. The first night out I paired the EP with my Orion 80mm ED, F7.5 APO. I targeted Jupiter and was immediately impressed by the view. The view was sharpe and clear with great transmission. I put in my TeleVue 3x Barlow and my Celestron 2x ultima Barlow. Both combos provided very sharpe views. When I turned the EP to various DSOs, again I was not disappointed. The view was clear and without any noticeable distortion. Indeed it appeared sharpe until the outer edge of the FOV. at that point minor distortion began to show. I am very pleased with this EP. The FOV is nice and the eyerelief is such that I can take in the entire FOV with comfort. Obviously it’s not as sharpe as my top tier plossls, but it’s not far off and is easier on my eyes. It produces dry little distortion which would probably go unnoticed if one is not doing critical observing. The contrast was very nice showing much clarity in the features of Jupiter. Also, the background remained dark with little blur from the edge of the globe. The eyerelief was more the adequate for the observer to easily take in the entire FOV. Subsequent uses with my other scopes has not changed my view. Highly recommended especially for the price. Not sure about the coatings, as mine does not have anything printed on the eyepiece itself, but acceptable views nonetheless. Excellent basic, no frills eyepiece for the price. Light weight and appears to be very good optically with good contrast. Works great on Jupiter in my 127mm Mak. Review by Penguin of The Hague, Netherlands. I wanted an 8mm eyepiece with more eye relief than a standard Plossl. This one has twice the eye relief of an 8mm Vixen NPL Plossl for example. I'm not sure about the 60 degree AFOV, but it seems wider than most 52 degree Plossls. I can't really complain at this low price. It has a nice wide eye lens too. It doesn't feel like I'm looking through a pinhole. I noticed a slight bit of color separation, but maybe my scope wasn't properly collimated. That's why I only gave it 4 stars. I collimated my scope today, but now it's too cloudy to try again. If Agena offered a 6mm version, I'd probably buy one of those too. By the way, this is a very light eyepiece. I plan to use it with a 5 inch long Barlow lens. I don't want a big heavy eyepiece on the end of my Barlow to strain my focuser. 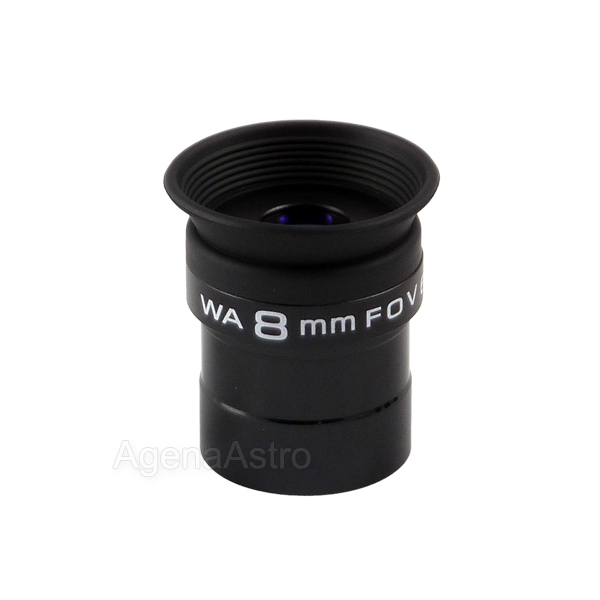 This is a nice small lightweight well made eyepiece that works great with a Barlow. Review by Jeffie of Silver Spring, MD. I use this eyepiece in an 8" Dobsonian scope. It performs poorly under all conditions. I don't recommend this at all. It is very hard to focus, and the opening is so small that my eye gets tired almost immediately. Review by old man of the sky of Portland, OR. It is a good eyepiece, color is good, the fov is I think a little shorter than stated, but I am not a good reviewer and I can not say it right. But I would tell my friends to buy one. And agenaastro has fantastic service and I will be purchasing from them again, I am disabled and don't have much money, but you should buy one of these eyepieces and you will not be disappointed. Review by Mat of Halifax, NS. I've not had the chance to use this EP often but it's nice to have it available and know that when I do need to use it. It's an EP I can rely on to give a nice view. 4.0 I like this lens! Another review a few down caught my eye about this lens as I too use an 8" dob. His views on this lens are well founded as I had similar good results. The lens quality is very nice. Well machined threads, solid construction, quality optics. All at a price that most anyone could afford without too much strain on the old piggy bank. I was wanting to find a nice fov at this magnification and that's what you get. Getting 60 degree fov with my scope pushing 150x (300x Barlowed) is a nice combination indeed. I also had no problems with the eye relief either. As mentioned in other reviews you do have to really put your eye up against this lens to see the whole picture. It doesn't suffer from blackouts like the EW lenses did with my scope, which is a plus. I think this lens series is a tad better than the EW run. I also liked the eyeguard, felt really comfortable for long viewing sessions. Nice and soft. This is another line of lenses I wouldn't mind completing. With sharp visuals and solid construction I'm one satisfied stargazer. Give one of these a go, you'll become a believer too. I've really become quite a fan of the Agena brand and this little guy carries the torch another mile. What a nice little lens. Another review a few down caught my eye about this lens as I too use an 8" dob. His views on this lens are well founded as I had similar good results. As usual the lens quality is very nice. Well machined threads, solid construction, quality optics. All at a price that most anyone could afford without too much strain on the old piggy bank. I was wanting to find a nice fov at this magnification and that's what you get. Getting 60 degree fov with my scope pushing 150x (300x Barlowed) is a nice combination indeed. I also had no problems with the eye relief either. As mentioned in other reviews you do have to really put your eye up against this lens to see the whole picture. It doesn't suffer from blackouts like the EW did with my scope. I think this lens series is a tad better than the EW run. I also liked the eyeguard, felt really comfortable for long viewing sessions. Nice and soft. I received my Agena WA 8mm eyepiece and was kind of skeptical of how a wide angle eyepiece of its price range would perform. Well, upon inspection the eyepiece was well made and the glass was much larger than any of my comparable plossls. I tried it out in 2 of my scopes, a 12.5" f/5 Newtonian dob and a 4" f/12 Maksutov. I will say this little eyepiece is a performer! Mars through the Mak was very nice with surface features very visible. I also viewed Saturn with the Agena WA 8mm in my Mak and it was tack sharp and I was able to make out banding on the planet. I used it to split Polaris and checked out the Trapezium in M42 and it did a wonderful job with no visible false color. I also did this all in my 12.5" dob and it performed well with very little coma at about 90% out. I made out all 6 stars in the Trapezium and was able to see the entire Double Cluster within the field of view. I also tried it with my glasses on (I really don't observe with my glasses on, but it's important to some folks) and I did have to push down to see the entire field of view but not bad. I will say this eyepiece at its price level is a steady performer and I will keep it in my collection! Review by Bradcap1 of Missouri. I've had this eyepiece for about a month now, so the newness factor should have worn off by now enabling an unbiased review. I have an 8" f5.9 dob and was looking for an in-between eyepiece that would fall between the 10mm plossl that came with the scope and the 6.3mm plossl that I purchased later. Let me say that I've never been overly impressed by the 6.3mm plossl due to the narrow f.o.v. So I was thinking that a wide-field eyepiece would be in order here. After looking around and reading numerous reviews it appears that there is no consensus on a preferred eyepiece in this range for my scope. However there seem to be numerous recommendations for eyepieces all in the $130-$300 range. Then I see that Agena offers a wide angle 8mm eyepiece...C'mon, can you really get a quality wide-field eyepiece for this price? Apparently the answer is yes. I've been using this eyepiece primarily for observing Jupiter which is the only planet easily visible in the evening right now. The FOV is pleasant and obviously larger than the plossl although some chromatic aberration is evident at the extreme edges of the FOV. I should point out that eyeglass wearers will have difficulty using this eyepiece since you have to force your eye all the way into the cup to enjoy the entire FOV. But the views have been wonderful. Brilliant bands and the Great Red Spot are easily seen with this eyepiece. The nice thing is that with my other plossls, the bands and the spot appear gray or black. With the Agena WA these features appear pink which I assume are more as they would normally appear. This eyepiece also barlows well. I recently acquired a 2" ED barlow and popped this eyepiece into it to view Jupiter again. All I can say is that this view was extremely pleasing. For the price this eyepiece cannot be beat. I would put it up against plossls more than twice its cost. I received my Agena WA 8mm eyepiece around Feb. 18th and was kind of sceptical of how a wide angle eyepiece of its price range would perform. Well, upon inspection the eyepiece was well made and the glass was much larger than any of my comparable plossls. I tried it out in 2 of my scopes, a 12.5" f/5 Newtonian dob and a 4" f/12 Maksutov. I will say this little eyepiece is a performer! Mars through the Mak was very nice with surface features very visible. I also viewed Saturn with the Agena WA 8mm in my Mak and it was tack sharp and I was able to make out banding on the planet. I used it to split Polaris and checked out the Trapezium in M42 and it did a wonderful job with no visible false color. I also did this all in my 12.5" dob and it performed well with very little coma at about 90% out. I made out all 6 stars in the Trapezium and was able to see the entire Double Cluster within the field of view. I also tried it with my glasses on ( I really don't observe with my glasses on, but it's important to some folks) and I did have to push down to see the entire field of view but not bad. I will say this eyepiece at its price level is a steady performer and I will keep it in my collection! Better color than a plossl as well as a wider field of view; Barlows well. Have to force eye into eyecup for full field of view; Some chromatic aberration evident. Then I see that Agena offers a wide angle 8mm eyepiece for $36 shipped...C'mon, can you really get a quality wide-field eyepiece for $36? Apparently the answer is yes. I've been using this eyepiece primarily for observing Jupiter which is the only planet easily visible in the evening right now. The FOV is pleasant and obviously larger than the plossl although some chromatic aberration is evident at the extreme edges of the FOV. I should point out that eyeglass wearers will have difficulty using this eyepiece since you have to force your eye all the way into the cup to enjoy the entire FOV. But the views have been wonderful. Brilliant bands and the Great Red Spot are easily seen with this eyepiece. The nice thing is that with my other plossls, the bands and the spot appear gray or black. With the Agena WA these features appear pink which I assume are more as they would normally appear. For $36 this eyepiece cannot be beat. I would put it up against plossls more than twice its cost.